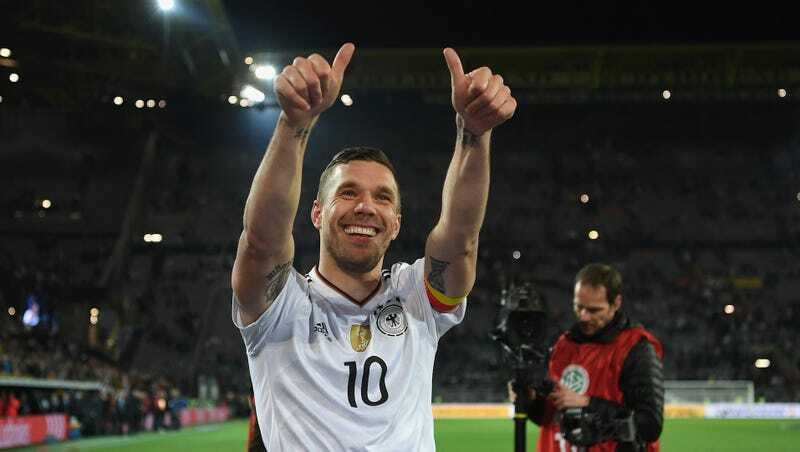 In Lukas Podolski’s last appearance for Germany’s national team, the former Arsenal man, corner kick extraordinaire, and guy known for absolutely crushing the ball launched a rocket into the top right corner in the 69th minute to beat England 1-0 in the friendly. It was the perfect final goal for the 31-year-old German star, who, after playing 130 games with the national team, retired from international duty. Podolski currently starts for the Turkish club Galatasaray, and after his performance today, I couldn’t be the only one wondering if Lu Lu Lu Lukas Podolski might have a few more years of international soccer left in him. But alas, according to this farewell, it appears he’s finished. Did ESPN Really Make Up An Entire Interview With German Striker Lukas Podolski?